Buy skin-on, bone-in thighs at the grocery store and remove the bones yourself—it’s as easy as boning chicken thighs. 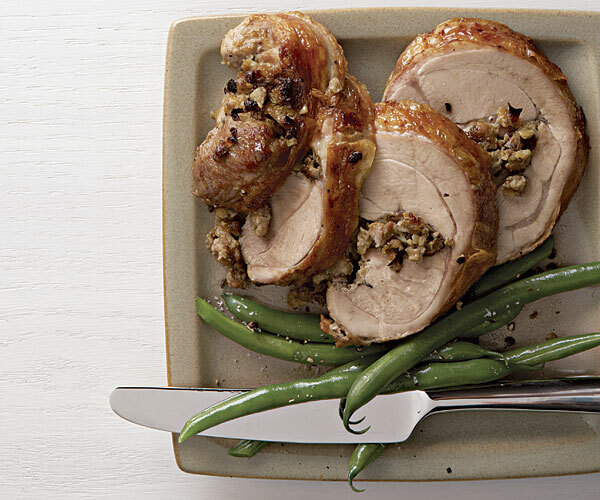 For more turkey recipes visit The Guide to Thanksgiving Dinner. Put the porcini in a bowl and cover with boiling water. Soak until soft, about 30 minutes. With a slotted spoon, remove the mushrooms from the liquid and chop finely. Save the liquid for another use or discard. Heat the olive oil in a heavy-duty 10-inch skillet over medium heat. Add the sausage and cook, using the side of a metal spoon or fork to break the meat into small pieces, until browned, about 5 minutes. Add the onion and garlic and cook, stirring, until the vegetables are soft and translucent, about 3 minutes. Stir in the chopped porcini, artichokes, thyme, and rosemary and cook for 2 minutes more. Transfer the sausage mixture to a large bowl and stir in the breadcrumbs and the Parmigiano. Season to taste with salt and pepper, and then stir in the egg. Spread the mixture on a plate and chill in the freezer for 15 to 20 minutes. Lightly season the boned thighs with salt and pepper. Spoon 1/2 to 2/3 cup of the stuffing into the empty cavity of one of the turkey thighs and spread the stuffing with the back of a spoon to fill the cavity completely. Repeat with the other thighs. Roll each thigh into a roughly cylindrical shape. Tie each stuffed thigh with 2 to 4 loops of twine to secure. (It’s OK if some of the stuffing pokes out at the ends, because the egg holds the stuffing together.) Brush the skin side of the thighs with the olive oil. 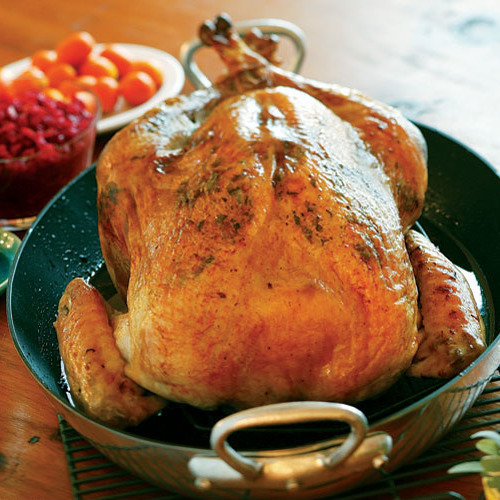 Lay the thighs seam side down in a small roasting pan or heavy-duty rimmed baking sheet and roast for 30 minutes. Brush the thighs with the pan drippings and continue to roast until the internal temperature reaches 165°F, 15 to 30 minutes more. Remove the strings and transfer the thighs to a warm platter. Let rest 10 minutes and then cut into 1/2-inch-thick slices and serve. Fantastic. Fun to make but it did take some time to put it together.I used 2 links of sausage one hot &amp; one sweet.This can be made ahead of time and refrigerated untill ready to put in the oven. This turkey thigh recipe was moist and delicious. The stuffing was wonderful - and it made a lot. Even with 4 thighs there was extra. Mine didn't hold together and look as nice as the photo, but it was still great. Way too much of a time investment for a weeknight...Made the buttermilk cornbread and roasted brussels sprouts with wild mushrooms to go with it. Yum. Tasty stuffing but more work to prepare than I bargained for during a weeknight. Mine did not look as pretty as the photograph and did not hold together very well.